The Fellowes Fusion 120 is a twelve inch guillotine paper cutter that is designed to cut up to ten sheets of 20lb paper at a time. This high quality cutter comes equipped with a stainless steel blade and a foldable preassembled SafeCut Guard that prevents contact with the cutting blade. The Fellowes Fusion 120 has a solid base with integrated non-skid feet. The cutting table includes cutting guides for various paper sizes, photos and angled cuts. All of this makes the Fellowes Fuision 120 an excellent choice for your personal cutting needs or for a small office or home office environment. Discover today what Fellowes can do for you. Full size SafeCut safety shield protects user during cutting process. Quality stainless steel blade cuts up to 10 sheets (20lb paper) at one time. Foldable pre-assembled SafeCut Guard makes set-up and storage quick, easy, and safe. Maximum 12” cutting width; solid base with integrated non-skid feet. Cutting guides for various paper sizes, photos, and angled cuts. Excellent paper cutter. Easy to use, a little stiff to lift the bar but other than that it makes my day easier because there is a lot of paper cutting involved. Precise cut. At about 4 weeks ago we purchased a Fellowes A4 Fusion Guillotine from Shredders Direct an Online Fellowes Reseller. It arrived the net day and we started using it straight away to get our presentations ready for all person company meeting. We found the guillotine to have an excellent cut and it was really easy to use cutting the paper in one swoop. The only thing I would say is we probably needed a guillotine that did 20 sheets at once instead of 10 just for a slightly speeder experience so we are thinking of getting the next model up the Fellowes Stellar A4 Guillotine. The Fusion A4 Guillotine is well made, compact, and easy to use. Construction is excellent - it is about 50% smaller than most equivalent items. My best purchase ever, at a competitive price. Welcome to MyBinding video. 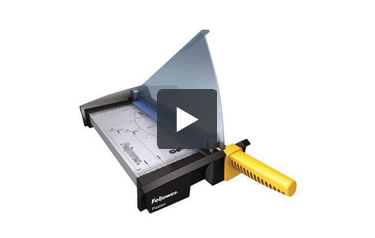 Today we look at the Fusion 120, a 12-inch guillotine-style paper cutter by Fellowes. Blade guide and paper guard flip right up and ample tools on the top help for precise cutting. Pressing down on the finger guard holds the paper in place while you cut. The 12-inch blade length and work surface allow for standard size documents or anything up to 12 inches in length. The Fusion 120 has a cutting capacity of ten sheets of 20lb paper per trim. That's the stylish, lightweight, and portable Fusion 120 by Fellowes. For more demos, reviews, and how tos on this product and many more, check out MyBinding.com. A guillotine cutter can be a handy device to have around when you need to cut several sheets of paper at once. One cutter that's currently on the market is the Fellowes Fusion 120. Here are its strengths and weaknesses. Check them out to see if this is the product you need. The Fusion 120 has a cutting length of 12 inches, so it's perfect for letter-sized documents that measure 8.5" x 11". You can also use this cutter to take care of smaller sizes of paper as well as photographs. Staying safe is very important when using a guillotine paper cutter and it's easy to do with the Fusion 120. This device comes with a preassembled SafeCut guard that's fan-shaped and will keep your hands away from the blade. When you're not cutting, the guard can be folded down which makes storing the trimmer much easier. The Fusion 120 has a metal base that has cutting guides printed on it. The guides will show you where to cut to get the size of paper you need. And there's even a protractor that makes angled cutting much easier. Your work will stay in place because there's a paper clamp attached to this device. The clamp can be moved around to accommodate the size of paper with which you're working. And there are rubber feet on the bottom of the cutter so the entire thing will stay put as you use it. This not only ensures your work will turn out well, it keeps the process safe as well. The Fusion 120 is pretty affordable for a guillotine cutter. It will set you back less than $60.00 and it even comes with a 2-year warranty. The Fusion 120 doesn't have a particularly good cutting capacity, especially for a guillotine cutter. It can only cut a maximum of 10 sheets of 20 lb. bond paper at once. This definitely isn't the trimmer to get if you need to quickly cut a lot of sheets. Finally, this device's handle isn't very ergonomically friendly. You may find yourself fatigued if you cut a lot of documents in a short period of time. The Fellowes Fusion 120 would be good for home or office use, so long as you don't need a device that can cut more than 10 sheets at once. The cutting capacity and handle design makes this product unsuitable for extremely large cutting jobs, but it will do just fine for small ones. This device is really safe to use thanks to the SafeCut guard while the cutting guides make it easy to get the cut you need. Plus, this product is very affordable and it comes with a good warranty. If all of this is what you need in a paper cutter, take a look at the Fusion 120 today. Re: Fellowes Fusion 120 How do you sharpen the blade? Thank you for your question. The blade would need to be removed to be sharpened. Once removed check with local companies that sharpen knives, scissors, or lawn mower blades, many will also sharpen guillotine blades. Fellowes support would best be able to assist with any hands on support or guidance. Their number is 1-800-955-0959.